Way back when I did my tasting of pizza along the L train, I had a really good Neapolitan-style pizza at Fornino in Williamsburg. I was excited to hear that there was a Fornino opening near me, in Park Slope, a few months ago, and on a recent Friday night I met up with my friends Jeff & Eva to check it out. I did a little research before going over there. 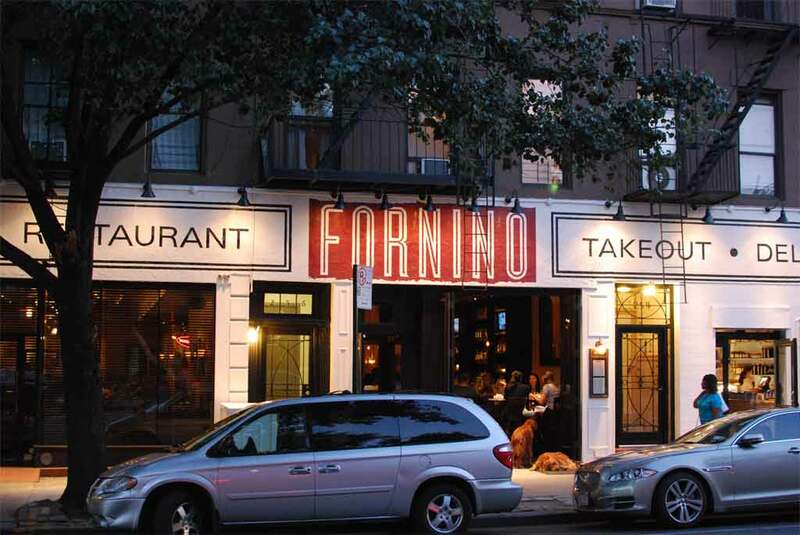 Unlike the original location, the Fornino in Park Slope specializes in grilled pizza. What I wasn’t prepared for was how big the place was, a big difference from the Williamsburg location. Also, even though it’s not a “fine dining” restaurant per se, there’s a much more upscale vibe at the Park Slope location. I was tempted to get some of the delicious sounding appetizers, but I decided to restrain myself and just stick to a pizza. 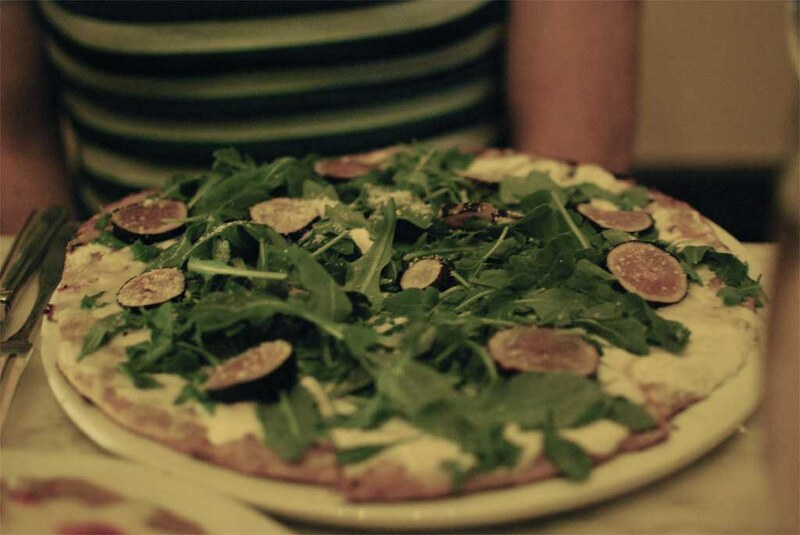 I got what I usually get when trying a new pizza place: the Margherita Classica ($12), while Jeff ordered the Gorgonzola ($14), which is topped with fior di latte, figs, and arugula. The grilled pizza means that the crust is super thin, almost like a cracker, and they cut it into strips, like is usually done in the Midwest. My margherita was great, with super fresh ingredients and a hint of heat from what may have been garlic in the sauce. The cheese was creamy and chewy, and the whole thing was wonderfully seasoned. My only gripe is that as the pie cooled it didn’t taste as good, it tasted more generic. The Gorgonzola pie was also great, especially when you got a bite of all of the ingredients together: the saltiness of the cheese, the sweetness of the figs, the bitterness of the arugula, and the tangy gorgonzola. Eva got one of the special pastas (my photo didn’t really come out): homemade fettucine (actually cut so wide that we all agreed it was more like pappardelle) lobster and fresh corn and tomatoes. She said it was delicious, and I believe her. Even the basket of free bread on the table was great. 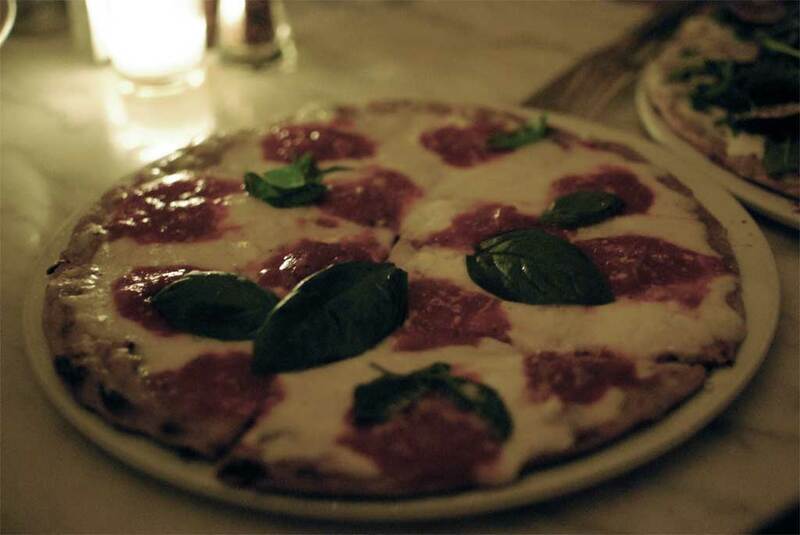 I could spend a lot of time at Fornino Park Slope, working my way through the menu of pizzas and pastas. I’ll have to exercise a little restraint, and wait until I can get some friends together to go back. Pizza is always better with friends.